The First Nations LNG Alliance is a collective of First Nations who are participating in, and supportive of, sustainable LNG development in BC. Owner/Operator: TransCanada Corporation and subsidiary NOVA Gas Transmission LTD (NGTL). Initial Gas : Montney, north of Dawson Creek. Receipt : Groundbirch near Dawson Creek. Delivery : LNG Canada facility near Kitimat. 2015-2016: Regulatory field work. Morice River and Sun House alternate routes proposed. however delays in final investment decision (FID) for export facility in Kitimat entails delays in pipeline construction as well. Nadleh Whut’en and Nak’azdli Whut’en opposed the project citing that they were not adequately consulted and asked for Judicial Review. Nak’azdli remains opposed to agreement. Delays due to waiting on final investment decision for Kitimat export facility (LNG Canada). Unis’tot’en opposition to projects, however Wet’suwet’en leaders say these members don’t speak for the Wet’suwet’en as a whole. Owner / Operator : Chevron Canada Limited. 2008: Federal EA approval in December. 2009: Provincial EA approval in January. 2010: Haisla approve lease of land at Bish Cove. 2011: Design and preliminary construction work begins. Export license granted. 2013: Chevron becomes operator of pipeline and export facility. Chevron signs benefits agreement with First Nations Limited Partnership. 2014: JGC/Fluor consortium gets Engineering Procurement and Construction contract. Woodside acquires 50% stake in project. As of Spring 2016, everything is moving forward. Currently in the Engineering and Design phase of the project. Waiting on Final Investment Decision to begin full construction. First Nations consultation started in 2014. Construction set to start in 2017. Some applications still under review. Project pending 2 pipeline section application revisions. Associated with the Kitimat LNG project. FACILITY : Douglas Channel LNG Consortium: AltaGas Ltd., Idemitsu Kosan Co. Ltd., EDF Trading, EXMAR. 2017/2018: Proposed commercial operations window. Project on hold citing “unfavorable market conditions”. Awaiting FID which was posponed to 2018, but likely on hold until conditions improve. This is a proposed export facility that is the intended delivery point for the PNG pipeline that already exists. The Douglas Channel LNG Consortium has pulled out because of global LNG surplus and reduced energy prices. Awaiting FID and subject to delays, but still still on track for imminent construction. Spill on Sept 8th, 2016 that was quickly contained. Spill was mostly water. Sarita LNG : Sarita Bay, 10km north of Bamfield. Pipelines to use existing and new pipelines but details haven’t been specified yet. Malahat LNG : Bamberton gravel and cement industrial area, 7km south of Mill Bay. Island Gas Connector : Sumas to the proposed Malahat LNG facility. Pipeline would run along ocean floor in Salish Sea. Steelhead – Currently only in planning/proposal stage. Sarita LNG – Currently Stage 1. Malahat LNG – Currently in community engagement and consultation phase, as well as EA process and conceptual engineering/design. Island Gas Connector – Currently early stages of planning and FN engagement. Sarita LNG -Huu-ay-aht are “”at the table”” discussing the possibility of the project. There is currently no definitive start year proposed. Malahat LNG -Proposed location is former cement factory and pre-existing industrial site. 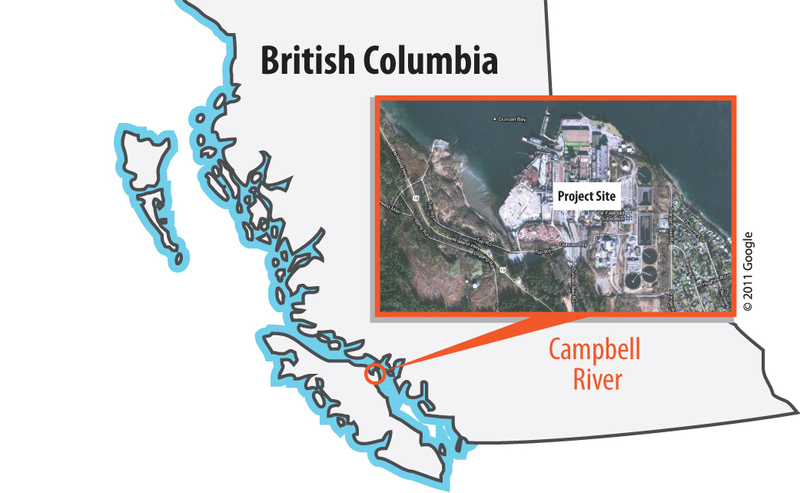 Island Gas Connector -Steelhead projects face challenge of having multiple proposed projects. If IGC doesn’t get approved, then that affects the other two projects. Additionally, the IGC requires federal approval from both Canada and US, not to mention the respective FN groups in both countries. The precedent set for FN engagement with LNG projects in Canada likely won’t be the same as the one in the US, so it’s important to keep an eye on how that is handled. Moreover, there will likely be asymmetrical benefit agreements as a result. Gas Supplied by Montney Formation region pipelines. 2011: Progress Energy Announces Strategic Partnership with PETRONAS, including an LNG JV. 2012: Petronas agrees to acquire partner, Progress Energy. PETRONAS receives approval to acquire Progress energy. 2013: Transcanada signed an agreement to construct a gas pipeline serving the terminal. Japex agrees to buy a 10% stake in the project. 2014: IOC agrees to acquire 10% of the project. FID postponed due to low energy prices. North Montney region of northeast B.C. Investigating options -will require Environmental Assessment and permits. Rockyview’s sites in the Horn River Basin in Northeastern B.C. PRGT has now announced 13 project agreements executed with First Nations in B.C. They include: Blueberry River First Nations, Doig River, Gitanyow, Halfway River, Kitselas First Nation, Lake Babine Nation, McLeod Lake Indian Band, Metlakatla First Nation, Nisga’a Lisims Government, Takla Lake First Nation, Tl’azt’en Nation and Yekooche First Nation. Construction will commence once Pacific NorthWest LNG has made a final investment decision. PNW LNG announced a positive final investment decision in June this year, with two conditions: Approval of related legislation by the B.C. legislature (approved on July 22, 2015), and approval of an environmental assessment certificate by the Canadian Environmental Assessment Agency. 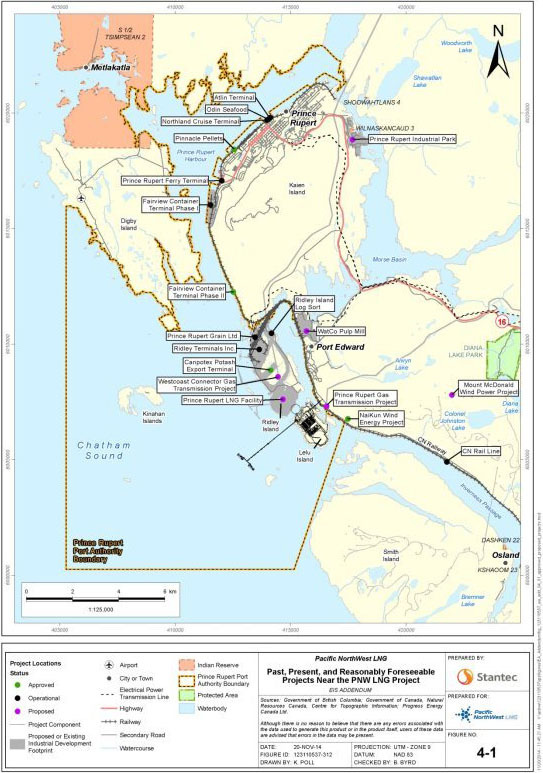 Should the certificate be awarded, PNW LNG will decide whether to confirm their investment decision and PRGT will begin site preparation for camp locations and other related sites shortly thereafter, followed by pipeline construction activities. PRGT expects to begin pipeline operations in late 2019 or early 2020. Nexen Energy (a CNOOC Limited company) and INPEX Gas British Columbia Ltd.
Environmental Assessment Certificate application been formally accepted by Environmental Assessment Office of British Columbia, 180-day review underway.